Dinosaur Provincial Park has been on my radar since before I even moved to Alberta last year. I finally decided to make the 6 hour drive from Edmonton as soon as the first warm days of spring arrived. It was primarily a scouting trip. I wanted to see what the place was like before tourist season and get a feel for the area before I return for a longer trip - probably in the late summer of this year when the shrubby plants are green. The last days of April were perfect for scouting photo locations. I was actually the only person camped in Dinosaur for the duration of my visit. I had all the trails to myself and was blessed with excellent light and clear blue skies. 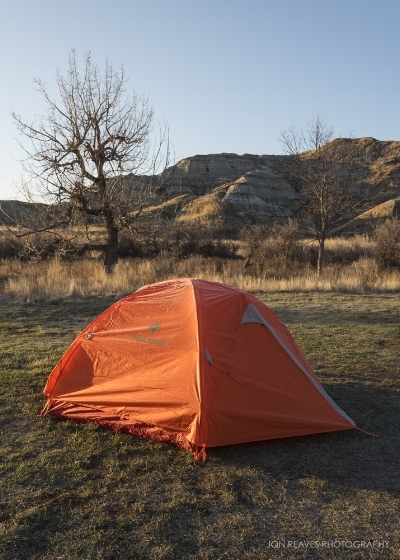 My campsite in Dinosaur Provincial Park. I had the whole Provincial Park all to myself for two days in late April. Though daytime temps can be very warm in spring, I found out the hard way that nighttime lows can still be below freezing. I'm a paleontology nerd since childhood. So, of course I stopped in Drumheller along the way to visit the Royal Tyrell Museum - one of the best Dinosaur museums in the world. I geeked out over dino skeletons and fossils for about an hour and then hit the road through the vast Alberta prairie. 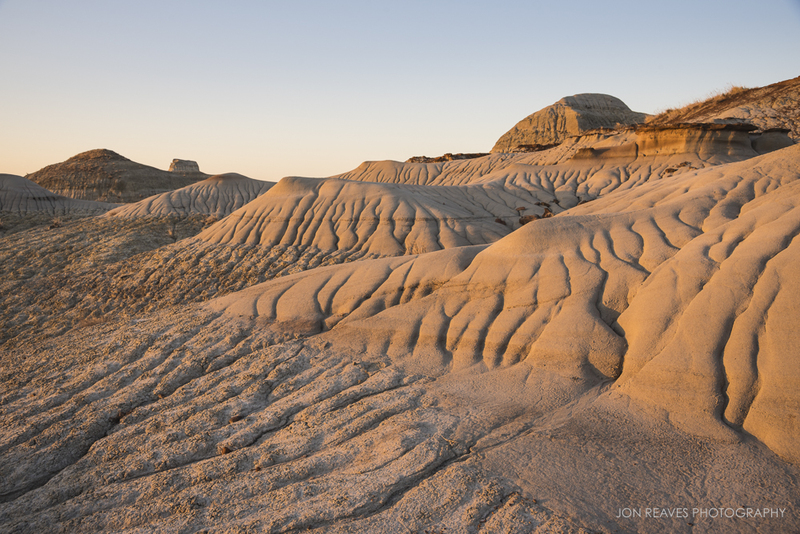 Dinosaur Provincial Park is one of the most significant fossil beds on earth. At the time of this writing, a more diverse collection of ancient life has been found there than anywhere else. I didn't spot any fossils on my hikes through the sandstone hills and hoodoos; I was more focused on the light and land forms. Though it was a short visit, I came away with several good images. Beautiful golden morning and evening light bathed the desolate landscape and brought contrast to the folds and creases of unique land formations. I found myself huffing and puffing as I quickly clambered over hills and up steep escarpments to find compositions before the light faded. I'd never been to an environment like Dinosaur before. I was completely inspired by it- everything was new and exciting. I can't wait for the next trip! All photos and text (c) 2018 Jon Reaves/Maps & Cameras. All rights reserved.